When we work on our art, we inspire others to do the same! Division Traveling Sketchbooks for all divisions, across the state. Sign up to receive your division sketchbook by emailing . Regional Traveling Sketchbooks for all regions in Texas. Sign up to receive your region's sketchbook by emailing . Let's get creative all over Texas! Use these monthly prompts as a springboard for creating in your own sketchbooks, and perhaps use them to inspire your students as well. Share your creations on social media using #taeasketchbook. There are several sketchbooks that are currently traveling among members of the different divisions: elementary, middle, high school, community-based, higher education, student and retired. If you are interested in contributing to a division-level sketchbook, sign up here. This form is for current members only. This new initiative puts traveling sketchbooks in the regions! Contact your regional representative or sign up to receive your division sketchbook by emailing . List your name, email, and region, and your representative will contact you. If you aren't sure which region applies to you, check out this resource. This form is for current members only. When you receive the sketchbook, turn to the first clean two-page spread on which you can create. Some sketchbooks have a designated prompt, some provide a mark or inspiration for the next artist, others leave it to you! Use any media, and be sure your work is dry before forwarding to another colleague in the division. You will receive a name and address to which you can send the sketchbook so it keeps traveling or you can contact me, , for the next participating artist. Share your work on social media using #taeasketchbook. Show off your best sketchbook work by entering the 2019 Membership Showcase! 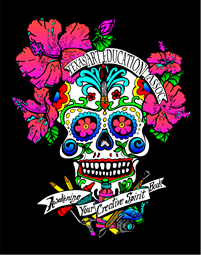 We will award a special Sketchbook prize; your work will be part of the Membership Showcase presentation in McAllen, and will be archived along with the rest of the Membership Showcase on the TAEA website. Join us as we celebrate the TAEA Creative Spirit with the 2018 Sketchbook Challenge, benefiting the TAEA Relief Fund for teachers in need. 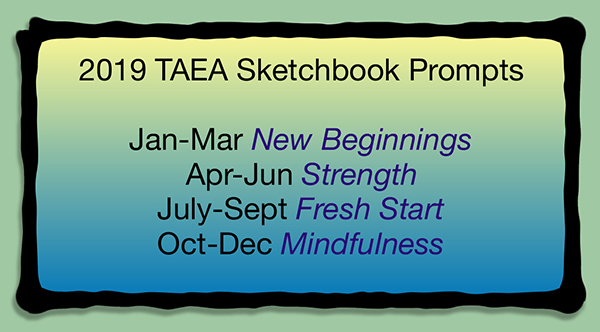 Each prompt for the sketchbook challenge was created by a contributing artist to the Awaken Your Creative Spirit Art Book, sold at the 2017 TAEA conference and now available for purchase through TAEA online. The art book features the artists' works, 25 prompts, and space for you, the artist. If you wish to order the art book, it is available to order with a minimum donation of $10 with $5 shipping/handling. Plan on sharing your creative responses at the 2018 TAEA conference! Awaken your creative spirit with TAEA!